As many of you know, I'm an avid bookworm. Aside from photography (and of course my family) books and reading are my other great passion in life. Reading for me is as necessary as breathing and taking photos. I have to read every day or I go a little crazy. It's why, when I first started working, I looked for jobs that had to do with books. I ended up selling & marketing books, which is not a bad career when you've been known to blow three quarters of your pay check in a bookshop less than 24 hours after it's hit your bank account! I have more books than I know what to do with. I've read quite a lot of them, but there are also many that I plan to get around to reading one day. I have 4-5 large bookshelves in my house and they are literally crammed full of books. Books on everything from fishing to true crime, fantasy fiction to parenting small children. Despite this, there are books that I absolutely adore and come back to time and time again. The Harry Potter series. The Outlander series. The Time Traveller's Wife. My favourite genre by far is dystopian fiction, a genre I was introduced to in year 12 when studying three-unit English and we had to read 3 dystopian novels for our HSC (for the record those novels were Utopia by Thomas More, 1984 by George Orwell and The Handmaid's Tale by Margaret Atwood). There's only one thing that comes close to the pleasure I get from reading and that's watching tv shows and movies based on my favourite books. In this day and age, I really think turning books in to tv shows is the way to go. Especially books that are part of a trilogy or series. With the news at the beginning of the year that one of my all-time favourite trilogies, The Passage by Justin Cronin is to be turned in to a series, and The Handmaid's Tale airing as a mini-series now, I thought I would share with you 5 other books/series that I think should get their own TV show. Now I know what you're thinking... hasn't this already been turned in to a TV series? Well, yes, it has. But so far there has only been 6 episodes that didn't cover anywhere near the whole of the first book. It was shown on ABC 3 and since it aired in May last year I've not heard another thing about it. So I would like to send out a plea to whoever is in charge of these kinds of things, please, finish it. At least finish the first book at any rate. It was much better than the movie that came out a few years ago! I'm currently re-reading this YA series that I first read about 2 or 3 years ago. I picked up the first book in the 6-part series from a bargain table one day because the cover and premise intrigued me (a mysterious bubble suddenly appears over a small town in California, and everyone over the age of 15 is ejected from the bubble, leaving only those under 15 in the bubble. These kids have to fend for themselves and contend with some of them starting to develop strange powers). The last report of any movement on a tv series from the books was in 2015 when apparently a pilot was being written, but nothing has been announced since. Crossing my fingers somebody will get the ball rolling on this sooner rather than later. The Wool trilogy is set on an earth where the air is no longer breathable and people live in underground silos in highly controlled environments. However, like all good sci-fi/dystopian series, things are not quite what they seem! I absolutely LOVED this trilogy when I first read them back in 2013, they were very well written and I was sucked right in from the first page, desperate to know the secrets of this world and what would happen to those who lived in it. If you've not read the books I highly recommend them, and I think they would make an absolutely gripping TV series. I first started reading the Stephanie Plum novels when I got my first job working in the city in 2002. I was a big fan of crime fiction back then, especially crime fiction that was funny, which these novels are. There's something like 25 books in the series now, and while it's been a while since I've read one I think they would work perfectly as a TV show. I did NOT see the shiteous movie with Katherine Heigl as Stephanie, there is no way I would ruin the books like that, so don't ask. But with the right writers and casting, this would be a show I would watch (Fun Fact... my first car, which we still have, is called Stephanie, named after the books main protagonist!). I am a massive Atwood fan. My fandom started back in year 12 when reading The Handmaid's Tale and hasn't abated in the 17 years since! Oryx & Crake and The Year of the Flood are two of my favourite Atwood novels, and I would love to see them bought to life on the small screen. I'm yet to read the final book in the series, MaddAdam (it's on my kindle and waiting for me to finish re-reading the Gone series) but I'm sure it's a cracker! One of the things I like about Atwood's work in the dystopian genre is the way she often creates more questions than she answers, and the world she has created in these two novels would be excellent fodder for a TV show. 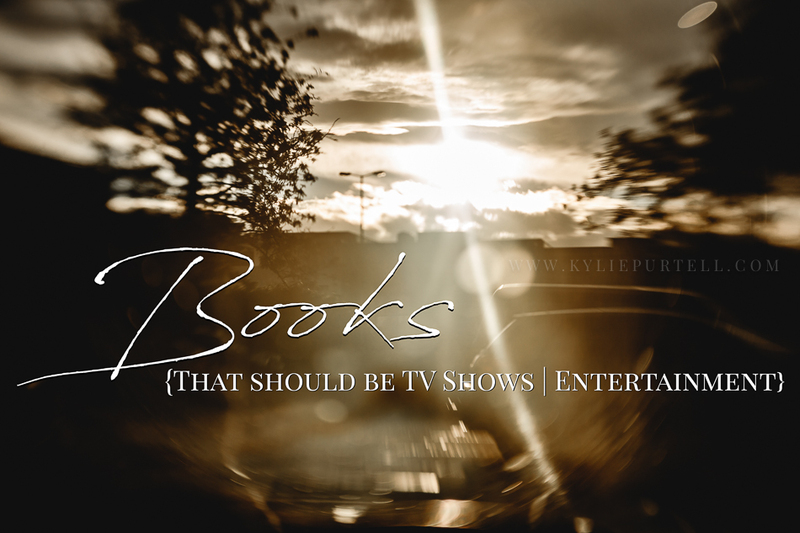 If you could have any book or series made in to a TV show what would it be?